Torula Yeast and Brewer’s Yeast are some of the highest sources of vitamin B6. Other good plant sources are whole grains, legumes, nuts and seeds, potatoes, cauliflower, bananas, and brussels sprouts. Extreme vitamin B6 deficiency is rare but there are characteristics associated with such deficiency like asthma, PMS, carpal tunnel syndrome, depression, and kidney stones. Other vitamin B6 deficiencies include depression, glucose intolerance, eczema, impaired nerve function, and cracking of the lips and tongue. Over 60 different enzyme activities in the human body are required by vitamin B6. It is important for a proper functioning immune system, red blood cells, mucous membrane, skin, and a healthy pregnancy. The basic defect in autism appears to be a decrease in numerous brain transmitters that require vitamin B6. Although it is not a cure for autism it can help improvement. People with low pyridoxal (vitamin B6) levels in their blood have a five times greater risk of having a heart attack than someone with normal or high levels. A deficiency of vitamin B6 leads to a buildup of homocysteine. Type II diabetics with a deficiency of vitamin B6 have a greater risk of having neuropathy symptoms. Vitamin B6 can also help inhibit glycosylation of proteins. The levels of vitamin B6 inside the cells is directly linked to the magnesium content in the diet. 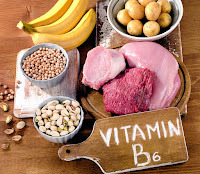 Vitamin B6 must have magnesium present daily.